There are several reasons why you should be looking for the best gravity boots, also known as inversion boots, available in the market today. Gravity boots are used to secure your ankles as you invert your body and begin your workout. You may need them for spinal decompression or simply for an additional challenge to perk up your usual workouts. Gravity boots are becoming quite popular right now. One thing is for sure – you only want to use the best ones that money can buy. You need to find the right ones for your specific needs so that you can take full advantage of what this product can offer. The best way to start is to take time to check out what’s available in the market before deciding which ones to purchase. DIMENSIONS- Suitable for horizontal bars from 1 to 1.5 inches in diameter. Inside diameter - 3 7/8", Outside diameter - 6 1/2", Length: 7 1/4", Padding: 1 1/4" thick. SUITABLE POPULATION- Suitable for people who have the basics of upside down training.Those who do not have the basics of upside down must be assisted by others and these people may feel ankles hurt . Made of high quality materials - Extremely durable and comfortable due to the high quality the gravity boots can withstand large amounts of weight (up to 150 KG).Included an assistant strap to help you up your body . Inverted therapy, which can be achieved with the help of gravity boots, can provide different therapeutic benefits that will surely aid in creating a healthier you. Due to high demands, there are several types of gravity boots that you can find online, but you need to find the perfect one for your specific needs. You need to make sure that it can carry your own weight and is safe for you to use. It is also important that you have checked with your personal doctor to be sure that inversion therapy is safe for you to follow. It is not for everybody, and only those with the right medical history and physical capabilities are able to utilize it. Just like many other forms of therapy, inversion therapy is dangerous for people with a history of high blood pressure, heart disease, or any eye diseases. Pregnant women are also prohibited from inversion therapy or at least need to consult with their medical doctors before beginning this routine. Also, make sure that you will have a partner before beginning each gravity workout. Similar to any other advanced type of exercise, you will need to have someone to check up on you to avoid any form of accident. This is to ensure that you will have someone to assist you if you need to get out of the boots or if you experience any health issues while upside down. 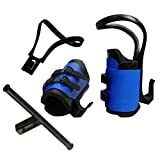 If you have checked and completed all of these prerequisites, you can now begin looking for the best gravity boots to provide your unique workout. You are already on your way to enjoying great six-pack abs or feeling the comfort inversion therapy can bring with the help of gravity boots. To name a few advantages, inversion workout provides better shock absorption and flexibility, relaxes tense muscles, and realigns weight-bearing bones. Besides checking out the prices of available boots, you need to take note of the materials used and reviews given by actual users of the equipment before deciding to buy a specific brand for yourself. Invest in high-quality equipment so that you can enjoy using it safely for a long period of time. You can also consider buying different accessories which are designed to perfectly match your gravity boots and make it easier to use them on your daily workout. When making an investment in anything, it is important to know exactly what you are investing in and if it is worth your time and your money. That is why we have put together this list of the ten best gravity boots on the market. This is to ensure that you aren’t wasting valuable time or a lot of money on something that isn’t worth it. That’s not to mention that safety is a huge factor that plays into inversion gravity boots. When investing in a pair, you want to ensure that you will be safe and secure when exercising, stretching, or relieving tension and pain in your back and neck. That being said, it is imperative to find a pair of gravity boots that are not only comfortable but are very secure and sturdy. Needless to say, you don’t want to be preoccupied with the danger of falling out of your gravity boots while in the middle of a workout. Doing research and finding the perfect pair of gravity boots for you is extremely important, and we want to help you do so. We have done the research for you so that you can spend more time enjoying your inversion therapy and workouts as opposed to searching high and low for the right pair of gravity boots for you. Here are the top 10 gravity boots that you can find in the market today. With an even stronger and better design than standard Teeter gravity boots, Teeter EZ-Up XL boots provide additional security. These boots have longer straps and taller shells that afford better calf support. They are perfect for people who are ready for more advanced gravity workout routines. Buyers can rest assured that EZ-Up XL boots still have the same quality as the standard Teeter boots along with additional, better features that provide even safer and more comfortable workouts for the user. No need for you to spend a lot of time at the gym in order to use special gym equipment. With these gravity boots, you can do your regular workouts at home and get better results. Teeter EZ-Up XL boots come in the color black so they can be easily distinguished from the standard Teeter gravity boots, which are blue in color. With the XL boots, you will still enjoy portability and durability, which are features widely associated with all Teeter Hang Ups products, along with the additional advantage of super-soft foam that provides comfort and support at the same time. The boots come equipped with adjustable buckles with extra inches to make sure they can fit a wide variety of users. They also feature a taller shell support to secure the ankle and provide extra security while the user is upside down. Plus, they are provided with removable calf loops to reduce the weight load on the knees and feet. Along with all of these attractive advantages, the product comes with a five year warranty to give buyers the assurance that they can enjoy using the boots for a long time. The XL gravity boot is made up of DuPont Hytrel material, which is well known for providing toughness with a pliable blend. In the XL boots, you can easily begin inverted exercises such as squats, sit-ups, and crunches without the fear of falling on the floor. You will hardly feel as though you have them on because they weigh only 2.5 pounds. Remember that there is really no age limit as to who can use and enjoy doing the inverted workouts as long as they have the go signal from their medical physician. People who are starting to feel back pain due to aging can highly benefit from this kind of workout. Just make sure that you have a buddy every time you do your gravity workout at the gym or in the comforts of your home. You will surely notice the difference compared with doing a regular exercise routine. With inversion exercises, you will be able to relieve the pressure on your ligaments and vertebrae discs. Gravity workout will also provide you with better blood circulation and improve your flexibility. Just like the standard Teeter Hang Ups gravity boots, the Teeter EZ-Up XL is also compatible with the Conversion Bar, Inversion Rack, and Teeter Inversion Table. With these accessories, you can surely enjoy doing your advanced gravity workouts anywhere and anytime. All the additional gadgets are sold separately, and you can easily find the best options online. However, you can always enjoy your gravity boots without any additional accessories if you prefer. Just find a sturdy structure with enough height to allow you to do your upside-down workouts safely. The leading brand in gravity boots, Teeter EZ-Up deserves to be near the top of the list. These gravity boots are portable and lightweight which makes it easy for you to take them along with you anywhere. They are also perfect for the Teeter E1-1056 Hang Ups Rack. These boots are designed to provide comfort, especially in performing leg and core-strengthening workouts. They are perfect for stretching and inverted decompression routines as well. It is easy to test your limits in a pair of Teeter EZ-Ups without suffering from unwanted pain on your ankles as a result of using the wrong gravity boots. These boots were designed by Roger Teeter, who personally suffered from back pains. His high-quality gravity boots provided a solution to his pain that not only changed his life but was effective for people all around the world who have suffered from the same problem. This is the reason that this product has been designed to perfectly answer the specific needs of the person who will use it. EZ-Up gravity boots can truly fit all sizes since they’re equipped with adjustable buckles that can provide you with a perfect fit. They also have self-locking features to insure safety. With their double-lock feature enabled, there is really no reason to worry about slipping or falling down while upside down. With their thick foam liners, you will surely enjoy the comfort that this type of gravity boots provides. Their shells are very flexible and lightweight, which makes it easy for the wearer to adjust them to their most comfortable setup. They are also furnished with optional calf loops to reduce the weight on your knee joints and on the top of your foot during your routine. This will enable you to adjust or bend your knees by two degrees, which prohibits the weight load from being focused on just one point. However, you can easily remove the optional loops if you don’t need them during your workout. You can enjoy using the EZ-Up gravity boots together with the corresponding inversion rack which enables you to turn a normal doorway into a gym. Just secure your rack into any doorway, preferably one that is not in a high-traffic area so that you will not be disturbed during your workout. If you don’t want to use the inversion rack, you also have the option of using the Conversion Bar which empowers you to use your EZ-Up gravity boots anywhere. Alternatively, you could consider the option of purchasing the Teeter inversion table. The inversion table will make it easier for you to employ a variety of different inversion workouts since it provides you with the comfort of having a strong table created for the sole purpose of doing these workouts. The Teeter Hang Ups bars, racks, and tables are sold separately, but you can take advantage of a bundle offer from Amazon. Potentially, you might even be able to utilize your gravity boots by themselves at the gym or in your home, as long as you have a secure place or structure from which to hang upside down and do your gravity workouts. Just put these boots into your gym bag and enjoy your workout anywhere you want. As we have discussed, just a few minutes of inversion a day can be extremely beneficial for one’s back, neck, and body. However, have we found the pair of boots that is the right one for you? Let’s take a look at 8milelake’s set of gravity boots. These boots offer both comfort and safety to users who are exercising, stretching, or decompressing. Coming in a brilliant light blue color with silver steel covers, these boots stand out from others in their style, combining attractiveness with the ability to alleviate back pain or ailments through easing the natural pressure of gravity on the spine. The 8milelake gravity boots are also durable enough for the user to perform many core and back exercises while inverted. The shape of 8milelake gravity boots is what really sets them apart from others. Being longer in the front and shorter in the back, the boots will give you a feeling of safety as you enjoy your inversion with peace of mind. Also, the security lock on an 8milelake boot is a single-action, meaning that you can spend less time struggling with locking yourself in and more time actually using the boots. Putting them on and taking them off is a breeze, but you are always secure when using them in your inversions. The 8milelake set of gravity boots also comes equipped with soft padding on the interior portion. The blue EVA foam creates a comfortable fit for your ankles and shins while you enjoy your workout or relaxation session. These pads are contoured to fit the natural curves of your legs and ankles, which adds to the comfort and ease of these boots. Since everyone is created with a different shape and size, these boots are a one-size-fits-most product. The lush padding creates an easy, comfortable hold for most people. There are many gravity boots on the market, but we are considering only the ten best products here. Still, narrowing it down to just one pair of boots might be a bit of a hassle. If you are looking for style along with comfort and safety, consider trying the 8milelake set of gravity boots. They provide practicability and stylishness all rolled into one great product. The Titan Fitness inversion boots can be deservedly included in a list of the best gravity boots available on the market today. These boots enable the wearer to enjoy from 30 seconds up to 2 minutes of inversion therapy. They are a perfect partner for people who do jogging, cycling, or weight training on a daily basis. Usually after a heavy workout, you may experience muscle fatigue and spasms. The gravity workout will help you to relieve the pressure on your suffering joints and bones. It is especially effective in reducing back pain. Titan Fitness inversion boots are the best equipment for achieving those goals. They are also a better alternative to your regular abs workout. These boots come in black, which will obviously match any workout equipment you already have. Furthermore, you won’t have to worry about cleaning them frequently since black doesn’t usually show any dirt, unlike other lighter colors. Carrying the boots anywhere is not a problem since they weigh only 3 pounds each. Their steel buckles are a unique feature securing your legs during your workout. With their well-padded foam sides, they ensure comfort and security to the wearer. When using the Titan boots, you will need to make sure that they are tight but still comfortable around your ankles before mounting to a bar or rack. If your legs are smaller than the minimum size of the gravity boots, you might be able to use some additional padding to secure your ankles into place, but it is better to be aware before making a purchase that the inside diameter of the boots measures 3 7/8 inches. You certainly don’t want to fall on the floor head-first because you are unable to secure your feet in your boots! The Titan Fitness inversion boots are compatible with standard 1 to 1 ½ inch diameter bars. You can always use them with your chin-up bar if you already have one of the same size. Before you begin your routine, simply make sure that everything is secured and you have someone to monitor your workout. It is best to have a partner who will be able to help you in case of emergencies. It’s also good to have a clock or timer on hand, since you shouldn’t exceed the recommended time limit for your gravity workout while using the Titan Fitness boots. If you want to continue with the routine, remember that it’s best to stop before experiencing lightheadedness. There is no need to assemble any parts when you order the Titan Fitness gravity boots, but if you don’t have a chin-up bar already securely installed in your home, you might want to consider obtaining one or doing your inversion workout at the gym. Wherever you decide to work out, you will need to find a sturdy bar that can carry your weight. Then you can enjoy your regular gravity workout without any problem. Remember, just as with any other form of exercise, you need to make sure it is safe for you to follow this new routine before seriously considering it. It is nice to keep your body healthy through proper exercise, but you should avoid testing your limits. Tonyko inversion gravity boots offer a versatile, yet inexpensive way to relieve compression fatigue and various other diseases caused by extended sitting or standing. Low pricing and high quality make this product one of the top ten best gravity boots. Double, easy-to-use, single-action locking mechanisms render this product completely safe and effortless to use. Tonyko gravity boots are great for everyone, but they are ideal for beginners because of the ease of installing and using them as well as the comfort they provide. Coupled with being easy to use, these boots are one-size-fits-most. The padding around the ankles provides a comfortable experience and the stability you will need in order to get the best inversion. For users with smaller legs, extra padding is suggested in order to ensure comfort and safety. The sturdy buckles and strong stainless steel allows peace of mind when using these gravity boots, so you are sure to enjoy your inversion as much as possible. Tonyko has also included combined safety levers and a single-step locking mechanism in order for you to enjoy a simple, seamless inversion. Tonyko’s innovation and safety-oriented design have come together to create a high-quality product that will give you the pain relief or relaxation you desire. For best results, pair these gravity boots with Tonyko’s standard chin-up bar with a diameter of 1 to 1 ½ inches. It is designed to hold up to 150kg and recommended for 30 seconds to 2 minutes of use. For your safety, do not push your limits, but stick to the recommended time of use. Don’t just take our word for how great these boots are! The reviews left by happy customers will confirm it! The quality is excellent and the price is great. They are safe and secure and worth looking into. The materials are of great quality as well, meaning that the product will not fall apart after a few uses. If you are looking to try inversion gravity boots, Tonyko inversion gravity boots are a great option. When you’re searching for a comfortable pair of gravity boots to alleviate stress, stretch your muscles, and relieve back pain, Hanging Pull Up Boots may just be for you. The low price and high quality of these boots make them a great option for people who want inversions but do not want to spend too much money. Padded with foam and secured with steel buckles, these boots provide both comfort and safety to the user. In addition to being easy to use, they are easy to put on and take off. They will also attach to almost any chin-up bar. While enjoying your workout or relaxation time, you can rest assured that you will be in good hands with the Hanging Pull Up Boots. The sturdy steel buckles and foam padding ensure a snug fit, while durable hooks guarantee your safety. The boots can hold up to 225 lbs., so you can improve your posture and relieve back pain with peace of mind. These gravity boots are great for those who want to step up their workout plan as well. Get an excellent core and/or lower back workout with a pair of Hanging Pull Up Boots, all the while alleviating any stress you may have in your spine. Hanging Pull Up Boots come in black. The high quality material with which these gravity boots are made will last for a long time, so that even though you won’t spend too much money on them in the first place, you will get your money’s worth. The design of the Hanging Pull Up Boots is especially made to fit your ankles perfectly, providing comfort and ease of use and ensuring that no one’s ankles can slip through the boots. Simply find a chin-up bar that is safe and can withstand your inverted workout, hook your Hanging Pull Up Boots on, and enjoy. An overall hit, Hanging Pull Up Boots have satisfied customers from everywhere who are raving about their ease of use, straightforwardness, and great quality. Through this article, you have become aware that you need to do your research carefully before deciding on a specific pair of gravity boots, since it is incredibly important to choose the right pair for you, your body type, and what you want to accomplish with them. But with such great reviews and such a great pair of gravity boots, you are bound to be satisfied and get the best inverted workout possible with Hanging Pull Up Boots. Looking for a pair of heavy-duty inversion boots that are also safe and comfortable to use? You should check out the Xtreme Monkey Platinum inversion boots. Designed specially to aid with back spasms, spreading-apart compressed disks, and for stretching the back, neck, and shoulder muscles, these gravity boots have specially designed contouring pads that create a maximum amount of comfort with a minimum amount of stress. Complete with a double-action locking mechanism for completely secure closure and soft, thick contoured padding, these boots are all you need to have a secure and satisfying inversion. Since the padding is contoured to fit the natural curves of your ankles and legs, you can rest assured that your inversion will not only be comfortable, but safe. You will not have to worry about slipping through or changing positions. You can enjoy your inversion and allow it to do what it was meant to do. Whether you are using it to relieve pressure on your spine, stretch out your back and neck, or get a great core-strengthening workout, these boots are top notch. The black with hammertoe finish gives the Xtreme Monkey Platinum boots a nice, polished look. 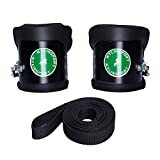 These gravity boots can be used with pretty much any chin-up bar and are extremely easy to use. The sturdiness of the double-action lock will ease any worries you may have about being inverted and susceptible to falling, but the quality and price of these boots are what makes them really stand out. If you are looking for a sturdy yet comfortable pair of inversion gravity boots, these just may be what you are looking for. We have looked at a long list of gravity inversion boots, but perhaps you still haven’t found the right ones. Maybe you should look at Fitness Maniac’s anti-gravity inversion hang up boots. Durable, lightweight, and stable, these inversion boots definitely warrant your consideration. Not only are they made well and very reliable, but they are inexpensive as well. With such a good deal, it makes no sense not to try them out – especially after reading all of the good reviews! The comfortable, contoured padding in these boots offers a strong and reliable hold for your ankles that is snug, yet soft. But don’t be fooled by the comfort and ease of use of these anti-gravity boots. They are completely sturdy and safety-oriented. Equipped with steel buckles, they firmly clasp you in so that you can enjoy a nice back stretch for muscle relief or alleviation of spasms. Overall, Fitness Maniac inversion boots are made with your complete safety and comfort in mind. The quality foam padding will permit you to enjoy your inversion without discomfort while the high-quality steel buckles will keep you firmly tucked into these boots. The Fitness Maniac anti-gravity inversion hang up boots can be used with almost any chin-up bar, so you do not have to worry about finding separate parts that match. If you already have a chin-up bar, you are good to go! These gravity boots are worth looking into if you want an easy, safe, and relatively inexpensive pair of inversion boots. They have even been specifically prescribed by specialists for treatment and exercises. Their versatility and the fact that they are simple to use makes them a great asset to your inversion therapy or workouts. Now we are going to look at the Body Solid GIB2 inversion boots. Similar to some of the other gravity boots we’ve already considered, this pair of boots is made of high quality, soft foam on the interior and are enclosed with a heavy-duty single-action locking mechanism. 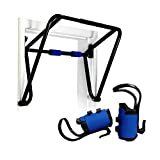 They are sturdy and can be used with most chin-up bars. Black in color, they are sleek and don’t show dirt as easily as other colors would. But what sets these boots apart from others? This pair of Body Solid GIB2 inversion boots comes with an extra pair of padding so that the user can adjust the fit of the boots around the ankles. Everyone is differently shaped, and many of us have differently sized ankles and legs. That being said, finding a pair of inversion boots for someone with relatively small ankles can be challenging. We all want to feel safe and secure in our inversions. The extra pair of padding that comes with the GIB2 inversion boots offers easy adjustments, extra comfort, and peace of mind. You can concentrate on your workout or your decompression rather than worrying about slipping out of the boots. Don’t worry about searching for specific equipment to pair with these gravity boots. The GIB2 inversion boots will pair with virtually any chin-up bar, so you can just strap in and go. They are easy to put on and take off and easy to use. With these boots you won’t waste time getting set up. You will be able to enjoy your inversion easily. Enjoy the comfort, ease, and stability of the Body Solid GIB2 inversion boots while luxuriating in a daily workout, decompression, or stretching session. Goliath Labs gravity boots are specially designed for hanging workouts. For those who want to step their exercise routine up a notch, these gravity boots are a perfect way to do so. Easy to use, comfortable, and sturdy, Goliath Labs gravity boots are an excellent choice for those who are serious about exercise. Whether your focus is abs, lower back, or simply stretching your back out and alleviating aches and pains, this gravity boot just might be for you. The hook-and-loop fittings along with reinforced plastic frames and double metal latches ensure quality and safety for the user. Easy to put on, take off, and adjust, these gravity boots are exceptional for someone who wants to get in a quick workout without having to go to the gym. Simply slip the boots on, tighten, and hang from any chin-up bar. It’s as simple as that. Not only are they extremely easy to use, but they are also comfortable. Using extra-soft padding, these boots were designed with comfort and convenience in mind. Enjoy your workout or your decompression time with ease and satisfaction. Whether your main focus is sit-ups, side bends, or even inverted squats, these gravity boots were made for you. The soft foam padding keeps your ankles, calves, and feet comfortable while you exercise so that you never have to worry about stopping to readjust. Furthermore, the ease with which you can set up and take down the gravity boots makes them a great way to exercise in a smaller area such as an apartment or condominium. You will, however, need a sturdy chin-up bar in order to use Goliath Labs gravity boots, so make sure you have access to a safely installed bar. With Goliath Labs gravity boots, you can improve your upper body and core strength from the comfort of your own home, knowing that you are in good hands. These boots can open up a whole new range of motion and exercise for your household. Once you’ve made sure that you have a strong chin-up bar that is sturdy and reliable, you can begin your new routine and watch your body transform! Goliath Labs gravity boots come in black and one size. The extra-soft foam padding ensures that your ankles are locked in firmly without any discomfort. Enjoy an excellent inversion workout in style and comfort! Experiencing an inversion is extremely beneficial for health and well-being. The scientific theory behind inversion therapy is that by shifting the gravity of the body, pressure is released from off of the back and traction is provided for the spine. This is why inversion therapy is great for people with scoliosis, chronic back pain, sciatica, or poor circulation. Inversion therapy has been known to improve the nervous system, slow down the aging process, reduce mental stress, and strengthen the immune system. Furthermore, gravity boots are excellent for different types of exercises. Sit-ups, side bends, inverted squats, and many other exercises can be more effectively performed with the right pair of gravity boots. Selecting that optimal pair of boots may be your first step toward improved health and fitness. Even a few minutes a day of inversion therapy or exercises might suffice to provide you with enormous health and fitness benefits, but first you need to make absolutely certain that you will be able to experience inversion with ease, comfort, and safety. Inversion therapy remains beneficial only if you’re using the right equipment. With the wrong equipment, you could seriously hurt yourself. That is why choosing the correct pair of inversion gravity boots is so important. Since everyone’s needs are different, it is fortunate that there are many different types and brands of boots out there. Take the time to read the descriptions, check out the reviews online, and make a well-informed selection of a pair of boots that will be perfect for you. By doing so, you will avoid a waste of time and money. Investing a little more time now, before purchase, will mean saving time later. Consider the following features in order to select the right pair of inversion boots – and get ready to enjoy that happier, healthier you. Safety is obviously your most important concern in purchasing a set of gravity boots. Check out the quality of the buckles. Make sure they have an adequate locking system. Also focus on the durability of the materials used in construction of the buckles and the product as a whole. Don’t forget to look at the measurements of the boot you’re considering for purchase. Ideally, the diameter of the opening of the boots shouldn’t be greater than that of your ankles. If your measurement requirements are exceptionally small, consider buying a pair of boots that come with extra padding. Padding that is specifically designed for the product you’re purchasing will be much safer and more comfortable than padding that you might try to provide for yourself. Since part of preparing to use your new boots safely is gaining your medical doctor’s opinion on the advisability of adding inversion therapy to your routine, you might take this opportunity to ask your doctor if he or she has a brand recommendation specifically for you. Getting the advice of a professional always takes some of the guesswork out of any important decision. It’s also critical to notice the total weight capacity of the boots you’d like to buy. Make sure that they will be more than adequately able to support your body weight. Inversion therapy probably won’t become a consistent part of your life if the experience is uncomfortable for you. There are a lot of factors to consider when looking for a pair of boots that will support your maximum comfort. First, notice the shape of the boot itself. The most comfortable sets of gravity boots are designed to conform to the natural shape of the foot, ankle, and leg of the average user. Next, check out the material used to line the boot. It should be soft and pleasant to the touch while still providing appropriate support. Look to see whether or not an optional loop is provided to help distribute your weight more evenly during inversion therapy. Check out the adaptable features of the boot. More adaptable boots are usually more comfortable than less adaptable boots. Since you probably won’t be able to try the boots on for yourself before making a purchase, especially take note of the general trend of the comments in customer reviews about the comfort level of the pair of boots you’d like to buy. Although every person is physically different and therefore has differing comfort requirements, you can learn from the overall tone of the comments whether or not most people find the boots to be relatively comfortable or not. Depending on where and how often you intend to use your new gravity inversion boots, you may have different requirements in choosing the boots. Make sure you’ve planned adequately before deciding on which pair of boots is right for you. Do you already have a sturdy, satisfactorily-installed bar for chin-ups? If so, make sure the boots you expect to buy will fit the bar you already have. Will you mostly use the boots at the gym? Or do you need to purchase a rack or bar in order to use the boots in your home? Additional purchases will add to the cost of the boots you choose, so if such purchases are going to be necessary, you’ll want to investigate the pricing of appropriate accessories for each brand of boots. Besides making sure that you’ll have the necessary accessories, think about how transportable your new boots will need to be. If you’re planning to take the boots along with you while heading to the gym or even in traveling, check out the total weight of the boots. Most are fairly light, but some are lighter than others. Decide if this factor is important to you before making your decision. Take another look at the buckles on the pair of boots you’d like to purchase. Along with being designed to support your weight with maximum safety, they should be constructed with ease of use in mind. How quickly would you be able to get into and out of the proposed pair of boots? Once again, inversion therapy will be less likely to become a habitual routine if it proves to be cumbersome and awkward to perform. You can help to avoid this problem by choosing boots that will be easy to transport, easy to put on and take off, and easy to use. Some gravity boots are better designed for the purposes of relaxation or simple inversion therapy. Others have been created with more strenuous workouts in mind. Look at the shape and style of the boots you’re considering for purchase. Read the descriptions and reviews carefully. Find out which brand of boot will best fit the plans you personally have for your new boots. Even if it comes at a higher cost, you are sure to be more satisfied with a boot that was designed to meet your specific needs than with one that is more loosely created for general purposes. On the other hand, consider whether or not more than one person might be using the boots that you will purchase. Although equipment such as gravity boots are better used by a single person, you will need to consider the requirements of both individuals if you intend to share the use of a pair of boots. Obviously, you will save money by purchasing gravity boots that will stand up to years’ worth of wear and tear and still remain functional and attractive. Consider the quality and type of materials that were used in the construction of the boots, the quality of their overall workmanship, and even their color. What will last best? Will it wash well? What parts are most likely to break, wear, or fray? Look for reviews written by people who have put their boots to the test of an extended period of use as opposed to reviews submitted by brand new users. Take particular note of any measurements or limits specified for gravity boots, including the width of the boots themselves, their own weight, their weight capacity, and the thickness of the bar with which they can be used. Do any personal bodily measurements or measurements of the equipment and physical spaces in which you plan to use the boots. If you need to purchase a bar, make sure you have a suitable place in which it can be installed. All of these specifications are important and must be taken into consideration in the purchase of the right pair of boots. Even after the most careful selection of boots, you may discover issues that you simply weren’t able to identify before actually trying the boots out for yourself. In order to avoid these types of disappointment as much as possible, consider looking for boots that offer a wide range of adaptability for different users. Do the boots come with optional accessories provided, such as loops for transferring weight loads or supplementary padding for added safety, fit, and comfort? Are the buckles highly adjustable? Are the boots themselves flexible enough to accommodate different body types comfortably? Every instance of greater adaptability increases the chances that the boots you purchase will indeed be perfect for you. A better product is often very well worth the extra expense that it usually entails. Before you choose the most expensive gravity boots in a bid for the highest quality, however, evaluate what you’re paying for. Check the features of the more expensive boots against the features of less costly brands. Do you really need those extra or different features? Do they directly support your goals for your new inversion experiences? Whatever you decide, make sure your buying choice reflects your unique needs rather than being based solely on the digits that come after that dollar sign. Also consider whether or not the boots come with a warranty, guarantee, or solid return policy. This may save you money and stress down the road if things do go wrong with your selection. How your new gravity boots will look certainly isn’t at the top of the list when you’re evaluating the wisest purchase. After all, this is not the kind of boot that you’ll be parading down the street – though you might be considering showing them off at the gym. Sagacious customers will make sure that they have put more important factors first in their search for that perfect pair of boots. However, if you’ve narrowed your options down to two or three brands of boots and still can’t decide between them, it might be time to consider which pair is more appealing in terms of appearance. After you’ve evaluated all of the options, it might be a good idea to make a priority list. Decide which factors are most important to you. Remember that safety and comfort should be at the top of the list, but other factors might be of more importance to one individual than to the next. Once you’ve pinpointed the features that make the most difference to you, you’ll be ready to use your knowledge of these top ten gravity boots to make the best decision – a decision that will create new, healthy habits and routines and positively affect your health, wellbeing, and fitness for a lifetime. If you know anyone who owns a pair of gravity boots, make sure that you utilize this resource by finding out from them which features of their boots function well and which could use improvement. Look at the pair of boots that you are considering for purchase and see how they compare with the boots owned by your friend. Do they appear to share similar strengths? Similar weaknesses? Use this information to help you make a more informed choice. Personal recommendations are one of the best sources of information when making any purchase decision, and gravity boots are no exception. You might even be able to slip a friend’s boots onto your ankles to test their comfort, fit, and ease of use. Note the dimensions of the boots and be sure to compare them with the dimensions of the boots for sale. Once you’ve decided on a pair of boots, buy and try with confidence. Don’t forget to write a review of your own on the gravity boots after you have experienced the benefits of inversion therapy firsthand. Remember the factors listed above in your review. Let others know exactly how your boots of your choice measure up to each of these factors to enable other people to make great choices of their own. Previous Post For Approximately How Many Minutes Should I Invert on My Inversion Table?